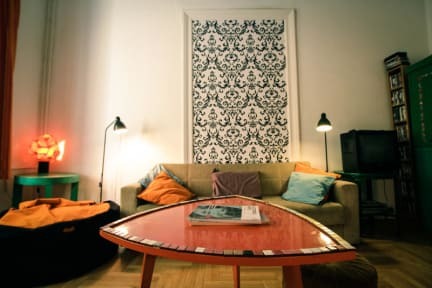 is situated between the Danube and the famous cafe street Vaci utca. As central as it gets, within walking distance to all the attractions. 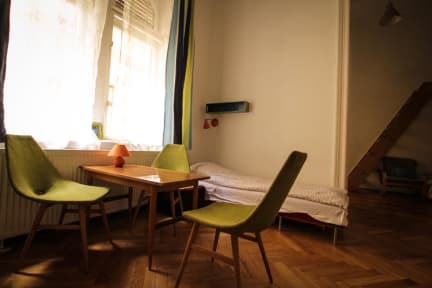 Green Bridge Hostel offers dorm beds, private rooms and apartments at a reasonable price in the heart of the city. As well as the facilities listed below, we have WIFI. 24 hour hot water, clean toilets and showers, Free Espresso, Free DVD Library. Flexible check-out, and an easy-going atmosphere. Our English speaking staff can answer all your questions about getting around; city, tours, caving, biking, statue park, etc, and your onward travel plans. Trams and metros nearby can take you anywhere in the city. Please note we are a NO SMOKING hostel.